Every lunar new year season, you will see smooth brown-colour tubs of nin gou (Cantonese) or glutinous rice cakes among the attractive lunar new year cakes and cookies sold in shops and festive stalls. That’s because this new year cake is an auspicious item used by traditional Chinese for lunar new year celebrations. In any Chinese dialect, its name nin gou literally means “year cake” while most Malaysians are familiar with kueh bakul, the way the Peranakan call it. I was browsing in a shopping mall when my attention was caught by traditional nin gou that were still in metal tins lined with banana leaves. As the young man promoting these cakes told me that they are made by his mother from his father’s traditional recipe, my thoughts raced back to memories of how a grand-aunt used to grind glutinous rice on a traditional millstone grinder for the flour to make these rice cakes. While we can conveniently buy glutinous rice flour off the shelves now, there was a time when homemade rice cakes were made by sheer passion and raw effort, starting with grinding glutinous rice on a traditional millstone grinder to make the glutinous rice flour from scratch! The Chinese like to attach auspicious meanings to words and phrases and are particularly careful with each utterance at the start of the lunar new year to ensure that good fortune will follow in the year ahead. When we were kids visiting relatives during lunar new year, I remember being warned not to say the word, “die” or risk being severely disciplined. My wild imagining of punishments like getting my mouth washed out with soap or raw chilli rubbed on my lips, certainly kept my wayward tongue from saying anything inauspicious. The sound of the word, nin gou, is also synonymous with the Chinese words for “year higher”, an auspicious phrase for sending good wishes for higher achievements and success as well as increasing abundance and prosperity in the coming year. These glutinous rice cakes are traditionally made in thick round tins but may also be shaped into ingots and usually presented as gifts, decorated with an auspicious red-colour Chinese character for “fatt” meaning prosperity. Only three ingredients – glutinous rice flour, sugar and water – are used to make this steamed new year cake. Some families have their own recipes like adding a pinch of salt to enhance the taste or spreading a dash of vegetable oil on the banana leaves that line the metal tins before the batter is poured in. This traditional cake, if properly prepared, can keep for more than a year without refrigeration because back in ancient days, refrigerators have not been invented yet. In some traditional recipes, the steaming time can be up to 10 to 12 hours over a charcoal or kerosene stove and the bubbling sugar as it caramelises, is a unique fragrance that connoisseurs of nin gou truly appreciate. The special sweetness of the glutinous rice cake is why the Hokkien and Peranakan call it ti kuay which literally means, “sweet cake.” When it is cooked, the cake is usually left to cool and settle for 2 to 3 days before they are lifted out of the tins. This cake is now available all year round as some hawkers sell them as snacks deep-fried in a delicious sandwich between a slice of yam or sweet potato. Eating nin gou is an acquired taste because it is not only sweet but can also be very sticky. After the cake is cooled, it solidifies into a slab and can be easily sliced into squares. The only true fan of nin gou in our family however, is dad who is happy to slowly nibble the solid slices especially while watching television. pan-fried by mum for afternoon tea! Around the lunar new year season we usually prepare nin gou squares, dipped in egg batter and lightly pan-fried, for afternoon tea. Another method to savour nin gou is to steam the cake slices and toss them in shreds of lightly salted young coconut to make a tasty dessert that resembles kueh kosui. The glutinous rice content in this cake can cause the consistency to be seriously stretchy and sticky for people who wear dentures so please be warned if you are going to sink your teeth in this sticky steamed cake! In the days before the dawn of the lunar new year, traditional Chinese families go about cleaning their home thoroughly to sweep out all the ill luck and make room to welcome in good fortune. Families that practice Taoism or Buddhism will clean their homes and kitchen altars and replace with new items and decorations. A week before the first day of the lunar month, nin gou and sweets like sugar-coated peanuts are offered to the Kitchen God before he leaves for heaven. As the recorder of the family’s conduct, the Kitchen God has an annual trip to heaven to report on that family’s good or bad deeds in the past 12 months. As a tradition, the nin gou and sweets are offered as a bribe so that he will make a favourable report to the God of Heaven. It is believed that when the Kitchen God eats the nin gou, his mouth will be clamped shut by its stickiness and he will not be able to make a bad report about the family! Check out the slice of nin gou sandwiched between a slice of yam [top] and sweet potato [bottom] - Yum! 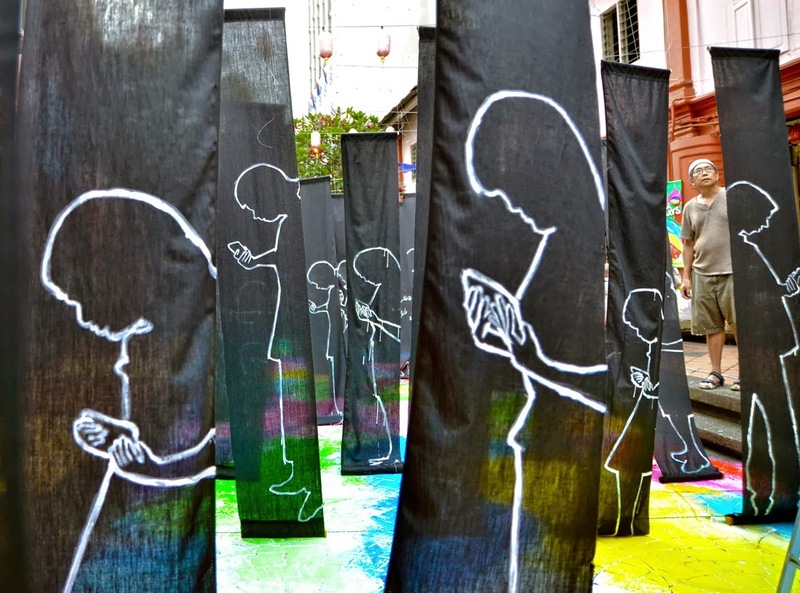 In 2011 when he was just 13, Yap HanZhen, a savant autistic teenager in Johor Baru had his first solo art exhibition. Themed, “Of Obedience, Solitude and Beauty,” HanZhen presented an exhibition of his pencil sketches of dogs, cats and butterflies and the profits from the sale were channeled to the Kiwanis Careheart Centre school fund. HanZhen started sketching as a hobby in 2009 and by keeping a daily routine in drawing he filled up dozens of sketch books with fascinating images. 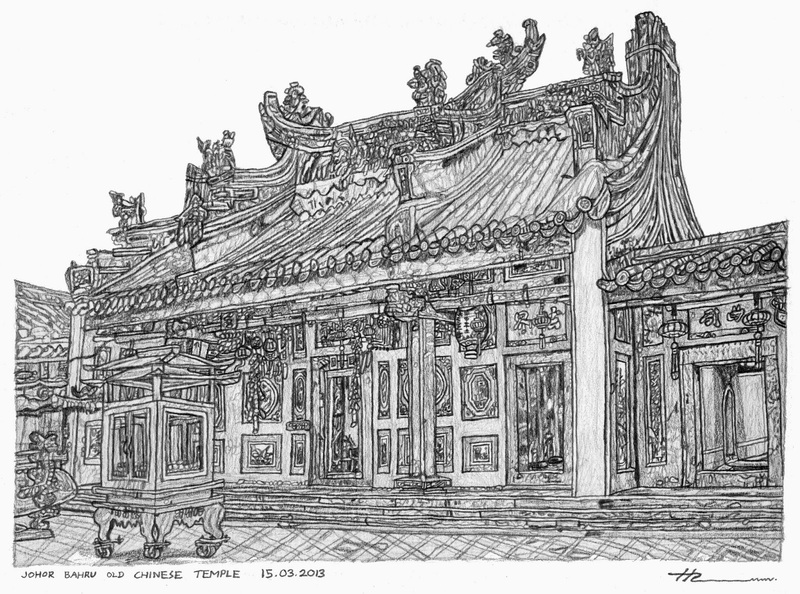 From animals, birds, insects and river creatures, HanZhen, now aged 15, recently started to draw Johor Baru’s charming old buildings to preserve the ancient icons’ architectural beauty for posterity. His sketches are so impressive that he has been commissioned by the Daiman Group to draw a series of Johor Baru’s old buildings for the new Double Tree by Hilton Hotel in Menara Landmark! His architect parents, Yap Yew Peng and Yvonne Yap, said their son was diagnosed as autistic at age 2 and they believe that the creative environment at home helped to develop his language through drawing. To expand his vocabulary and to communicate with him, they encouraged him to draw objects and label them. So he drew everything he saw, from everyday items at home to things they saw while on holiday, usually with great detail and accuracy. “It was almost by accident that we discovered he could draw while we were teaching him to increase his vocabulary for speech,” said Yvonne, who recalled that he could draw all the things at home and accurately labeled his pictures. He has an amazing gift in starting to draw an image from the top to the bottom or from the bottom to the top but either way, his sketches would all be completed in the right proportions. HanZhen may doodle a quick sketch in just 3 minutes or take a week to create a masterpiece and has drawn more than 500 documented art pieces in the last 2 years. HanZhen, a good-natured teenager who also plays the piano, attends a local mainstream international school and has teachers and school friends who appreciate his art. After school each day, he usually spends almost 2 hours drawing sketches with 3B pencils. His sketches have been sold during his school’s Open Days and the profits were donated to the school’s choice of charities. How many greeting cards did you receive this lunar new year? I remember how we used to get so many cards that it was enough to string them up in a long line as our festive décor. But the truth is, the number of greeting cards we received last Christmas and this lunar new year is at an all-time low and the number of cards we received so far can be counted by the fingers on one hand! Giving and receiving is a part of our culture and even in primary school, Chinese classmates used to exchange lunar new year cards with each other by passing it over by hand. I remember observing how these cards, distinguished by their pink colour envelopes, were sometimes left under books or slipped inside the desks. The joy of sending and receiving a card or letter is universal and in the days before electronic technology, the postman was my favourite man-in-uniform because he’s the guy who delivers my mail! I derive much pleasure from receiving cards and letters and am sure others do too so I make it a point to send out cards even when there is no particular reason. When Hallmark and Memory Lane cards became too expensive, I buy blank-inside cards from own-design card makers wherever I travel so that I can use them for any occasion. My sister in the UK, who is a postcard collector, is the happy recipient of interesting postcards that I send her from every destination that I travel to! Human connection and reaching out to one another is a basic human need and in our family, we have a tradition in sending greeting cards to friends and relatives for each festival, particularly at Christmas and the lunar new year. Every year, I will buy the cards for dad to write before I affix the stamps and post them. Dad has several mailing lists that he uses for reference at each festive season and he keeps them safely within the boxes of unused cards for easy retrieval next year. Aware of the delivery time necessary for overseas addresses, dad has a method of sending to those abroad first and then writing to the local addressees later. Every year, the sending and receiving of greeting cards keeps us in touch with friends and family members near and far and we are always delighted to hear from old friends, even if it was just once a year. If we received a card from someone who is not on dad’s list, dad will add him to the list and reciprocate by sending him a card! A few years ago, as usual I posted the first batch of lunar new year greeting cards to relatives abroad, including those in Singapore. About a week later, dad received a greeting card from a grand-uncle in Singapore who enclosed a small note with a stinging rebuke for causing him the inconvenience of paying a fine for insufficient postage. When dad showed it to me, I was simply mortified that I inadvertently put the wrong postage for his card and since that embarrassment, I always pay closer attention to the card addressed to him so that such a mistake is never repeated! While I have embraced the use of modern technology, there is nothing like the feeling of opening a stamped envelope that someone had taken the time to choose, write and post to me. Granted that there are cute icons and easy apps for sending electronic greetings, social media messages and emails but nothing can replace the joy of receiving a traditional card. We can say that we want to “save the trees” but something is definitely lost when we join the modern trend to send no cards, e-cards or group emails. Handmade or personalised cards are works of art and unique gifts that I will always treasure. A friend in the UK sends me greeting cards designed with his family photo on the cover and this gives me an annual update of how they look like as the children are growing up. A greeting card we received last Christmas that was created with a design by Quinlan Maling, a nephew in the UK, will certainly join my collection of precious card mementoes! This lunar new year marks a milestone in a new chapter for us as dad, who is getting on with age, decided to retire from writing greeting cards and handed the responsibility over to me. Using dad’s mailing list for reference, I sign off the cards with mum and dad’s names along with mine as I’m aware that their contemporaries who receive my cards, may not recognise who the sender is if my parents’ names were not there. There is a bittersweet feeling as I write the cards and read with a tinge of sadness that at least five name should be dropped from the list because they are no longer with us. Inspired by the spirit of the US-based Urban Sketchers, a group of people in Johor who are passionate about sketching, have adopted their principles and started to sketch scenes from observation in various locations in Johor. These individuals were already involved with sketching and painting in various mediums but the birth of Johor Sketchers brought them together to share their passion for sketching. Since its inception in June 2013 this group has been meeting regularly to capture on paper, some of the most iconic scenes that are unique to Johor. It all started when American, Buzwalker Teach, an art lecturer with Raffles University Iskandar in Nusajaya, met with local sketch artist, Taib Aur, at his kiosk along Jalan Wong Ah Fook. Teach, better known as Buz, was thrilled to see Taib’s sketches of local scenery and to meet a fellow sketching enthusiast. When Buz presented Taib with a book of sketches by Urban Sketchers, they were inspired to start a similar group in Johor and hoped to someday compile such a book on Johor life and landscapes. With this in mind, Taib connected Buz with local drawing enthusiasts like Mohd Hafizal Nordin, Eric Ng Han Meng and Khairi Maulana, who goes by the moniker, Tok Rimau, and they in turn invited their own network of like-minded friends to join Johor Sketchers. While each one has their own style and choice of drawing or painting mediums, they share the same passion for going on site to sketch scenes from real life. 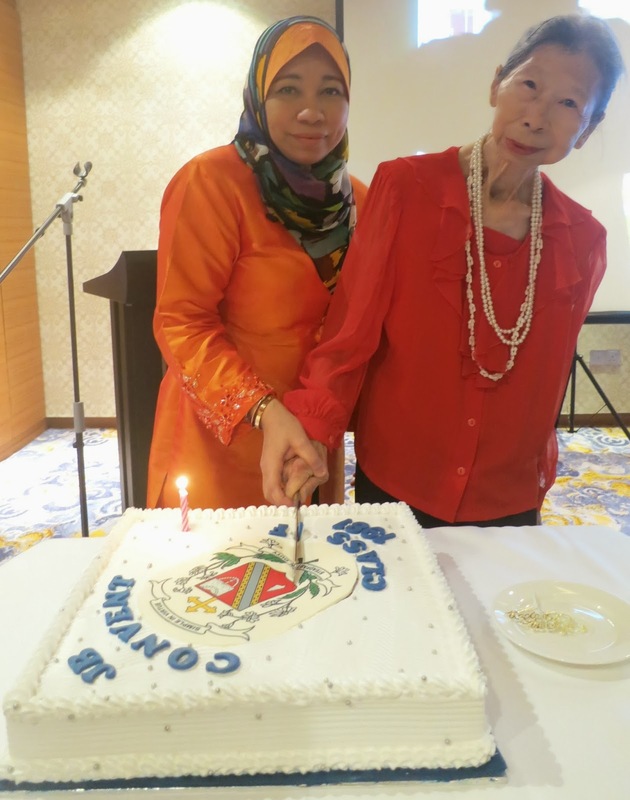 As this reflects the core principles of the Urban Sketchers to sketch from observation or to draw from life, it sparked off a creative connection that bonded the artists together distinctively as the Johor Sketchers. 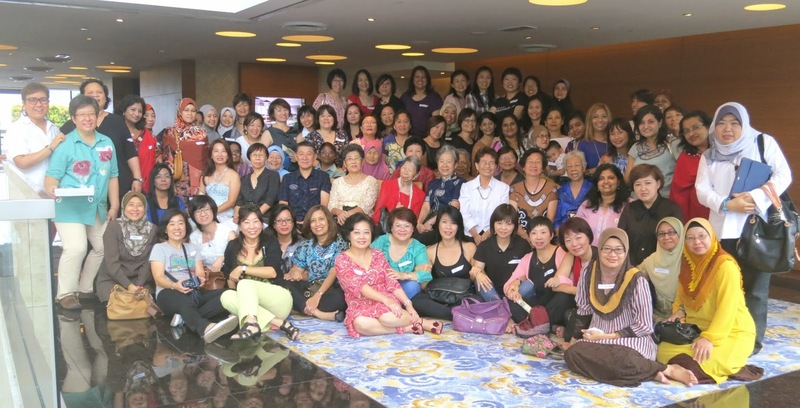 Members of Johor Sketchers started to hang out together and meet as often as twice a month for on-location events. Armed with his or her sketch book or sheets of paper, each sketch artist chooses a spot to sketch a scene or subject that appeal to him and soon after outlines appear on the paper in rapid freehand drawing, the images emerge. Very often, the artists keep visual diaries to record a series of scenes viewed from a variety of angles before the sketch is fully developed with water-colours or other types of paints. Johor Sketchers have captured interesting scenes from trips to places like the marketplace in Batu Pahat, nearby Senibong, Stulang Laut and Johor Baru’s old mansions and iconic buildings. Trips such as these allow the members to enjoy the outdoors and get to know a place by talking to the local people who come to observe them while they sketch. This not only gives them a sense of the place and its history but also an understanding of the sentimental value of a building or traditional lifestyle in a rapidly developing Johor. Recently the Johor Sketchers went on location to Kampung Bakar Batu Tampoi, a fishing village on the edge of the Danga River populated by Orang Seletar. The village presented rustic morning scenes of fisher-folk selling fishing bait from stalls, groups of women busy shucking mussels and boiling them in a cauldron heated by firewood while children and dogs play and loiter around. With an exclusive residential area being constructed on the opposite banks of the river and the new highway to Nusajaya in the horizon, members of the Johor Sketchers made it their mission to visually preserve such scenes as they are aware that sites like this may soon disappear. “Johor has big aspirations to develop into a modern metropolis but where will all this go?” asked Buz pragmatically as he added a few more details to his sketch of a wooden shack with one wall made of sheets of zinc roofing that the local fishermen use as a store for their equipment. He is seated on a low stool and surrounded by curious children as he sketched in the morning sun while Mohd Hafizal Nordin picked his spot on the wooden jetty to sketch the image of a roughly constructed wooden pontoon. With the tide out, this structure rested at an awkward angle on the dry shore but it certainly appears to be an interesting subject to him. “I take longer to draw a scene because I often stop to talk to people,” Buz added because he usually has curious observers asking him questions as in his experience while sketching a street scene at Tan Hiok Nee Heritage Walk. He encourages and inspires his students with field trips to interesting places like Tan Hiok Nee Heritage Walk where they can draw on location and mingle with the local people. Buz, who has been living in Asia for the last 18 years, with a year and a half in Johor Baru, is excited that Johor Sketchers has brought so many sketch artists together including a visit by the Urban Sketchers of Singapore to JB. 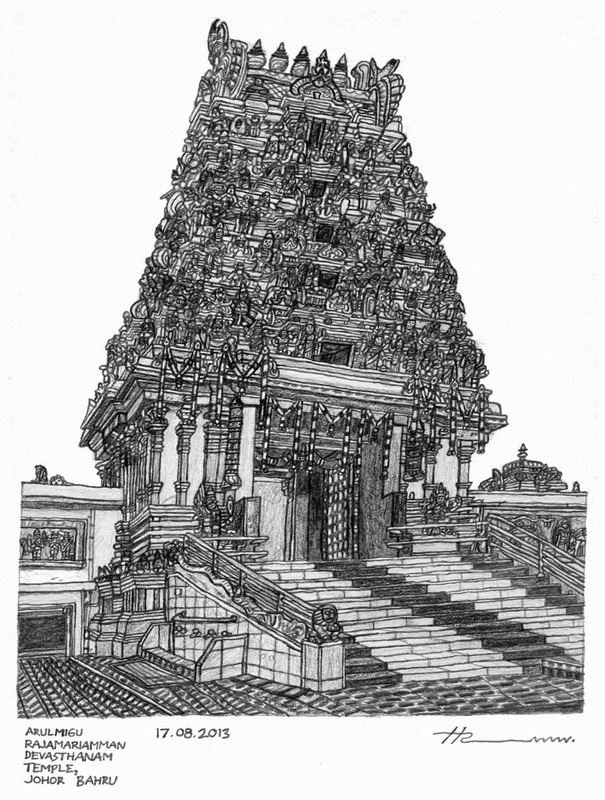 “When you sketch, you absorb the soul of a place,” said Tok Rimau and he went on to explain that the artist usually analyses the scene or the structure of a building before they start to sketch it. Like most naturally gifted sketch artists, Tok Rimau, had his earliest drawing lessons from his father and has now learnt a great deal more through his interaction with fellow members. He said all of us learnt to draw while we were in kindergarten and somehow lost the skills along the way but Johor Sketchers is encouraging everyone to rediscover the joys of sketching again. Since last May the chefs in Grand Gem, hand-picked from Kolkata, Uttar Pradesh and Tamil Nadu, have been pleasing connoisseurs of Indian cuisine in Johor Baru with their menu of North and South Indian specialties. Their recipes that are handed down through generations in their culinary districts, have certainly garnered more fans of Indian food here. Now diners who have a hankering for a variety of Indian food from starters, main course to desserts and drinks can enjoy a range of Grand Gem favourites presented in a lunch buffet served on Thursdays, Fridays, Saturdays and Sundays. You can even start your meal with dessert! Indian cuisine is not just about hot and spicy food and fans of Indian cuisine can look forward to tasting a buffet of Punjabi dishes on Thursday and Sunday while a spread of South Indian food from Tamil Nadu and Kerala will be served on Friday. On Saturday, the buffet menu dubbed the Grand Gem Special is served in a combination of North and South Indian specialties. The buffets are offered in Vegetarian and Non-Vegetarian choices and diners can start to enjoy lunch at leisure from as early as 12 noon. While the buffet is laid out in food-warmers and helpful waiters and chefs may be on hand as you help yourself to your meal, the starter item of vegetable spring rolls and a choice of plain or butter naan and paratha breads are served hot from the kitchen. So don’t be surprised when the waiter presents you with a platter of deep-fried vegetable spring rolls and chilli dip sauce. Help yourselves to the choice of saffron rice and curry leaf rice but remember to save some space to savour the freshly-made breads with gravies! Besides a traditional fresh salad of cucumber, onion and carrot slices, vegetarian diners have several choices of items to pick from. The menu may vary but you can expect vegetarian favourites like Palak Paneer or pureed spinach with cubes of cottage cheese, Dal Makhani or rich lentil stew, Aloo Bhindi or stir-fried potatoes with okra and Kumbli Broccoli Delite, a delightful dish of broccoli and mushrooms cooked with kadai masala and cashew nuts. To end the meal sweetly, enjoy a fresh fruit platter and traditional Rava Kesari, a popular South Indian dessert made from semolina. The range of dishes for non-vegetarian diners include Bhuna Gosht or classic lamb curry cooked in spicy onion tomato gravy and ground spices, and Chettinad Chicken Curry. There is also boneless Tandoori Chicken as well as Reshmi Kebab, juicy boneless chicken chunks that melt in your mouth because they have been marinated in a special blend of yogurt, cream, almonds and spices. At Grand Gem, you can recognise the Reshmi Kebab from its yellow coat of egg omelet! Diners can enjoy their meal on one of the swing-seats! In the spirit of the Lunar New Year, the Grand Gem will be serving an Indian-Chinese fusion menu from Jan 23 to Feb 14. Choose from two interesting set menus that cater to four diners each in the Prosperity Set (RM128) and Double Happiness Set (RM158). Diners may also pick from add-on items like the Grand Gem fish head curry (RM38) and seafood briyani (RM28.90). Located along Jalan Bukit Meldrum, at the lobby level of the Grand Bluewave Hotel Johor Baru, the Grand Gem is open daily from 11.30am to 11pm. Its comfortable spaciousness is tastefully enhanced by traditional Indian ornaments and décor, reminiscent of fine dine restaurants in India. The Grand Gem in Johor Baru is part of the Gems Group of restaurants that has established a reputation for its unique concept of presenting cuisines from all parts of India and setting new standards for Indian fine dining in Malaysia. The emcee initiates the bidding process with the audience! 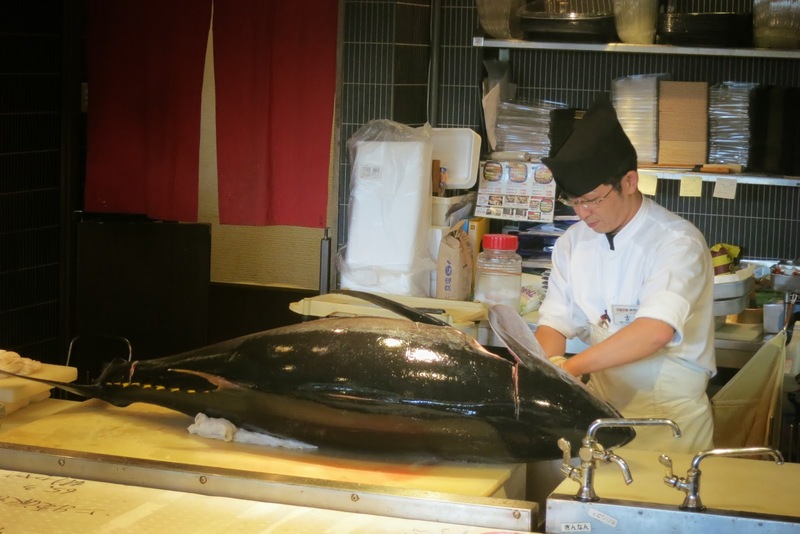 Every day at noon, visitors to Sakai City can join diners in Daiki Suisan Kaitan Sushi restaurant to witness a demonstration in carving up a Hon Maguro or bluefin tuna. This is one of the exciting highlights in our Osaka itinerary and while I’m partial to sashimi, I’m a little apprehensive about watching the fish being cut up. As our coach arrives and parks in front of the fish wholesale market where Daiki Suisan has two restaurants nearby, I don’t have time to mull over it as our group is welcomed and ushered into the Daiki Suisan Kaitan Sushi restaurant. 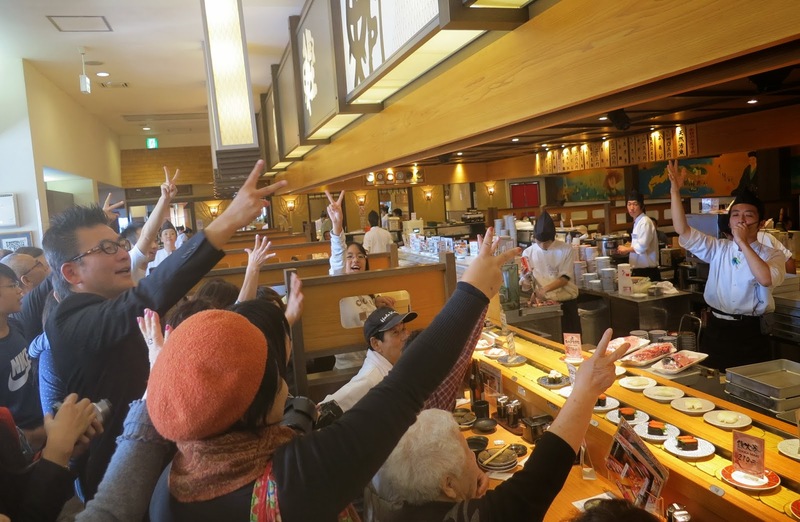 Guests are seated around a kaitan or conveyor belt, dining on freshly made sushi that they can pick from the moving belt but my eyes are riveted to the bluefin tuna that’s lying lifelessly on a cutting board. I realise that we arrived just on time. While the emcee-auctioneer is adjusting his microphone, a master carver is strapping on his gloves to start the carving demo. I’m standing behind a crowd, at least three deep away from the kaitan but I still have a clear view of the master carver as he raises his sharp knife to effortlessly slice off the fish’s jaw. With deft movements of his sharp knife, he removes the skin off the top of the fish head and proceeds to carve out one of the most coveted parts of the fish head – its fleshy cheeks. 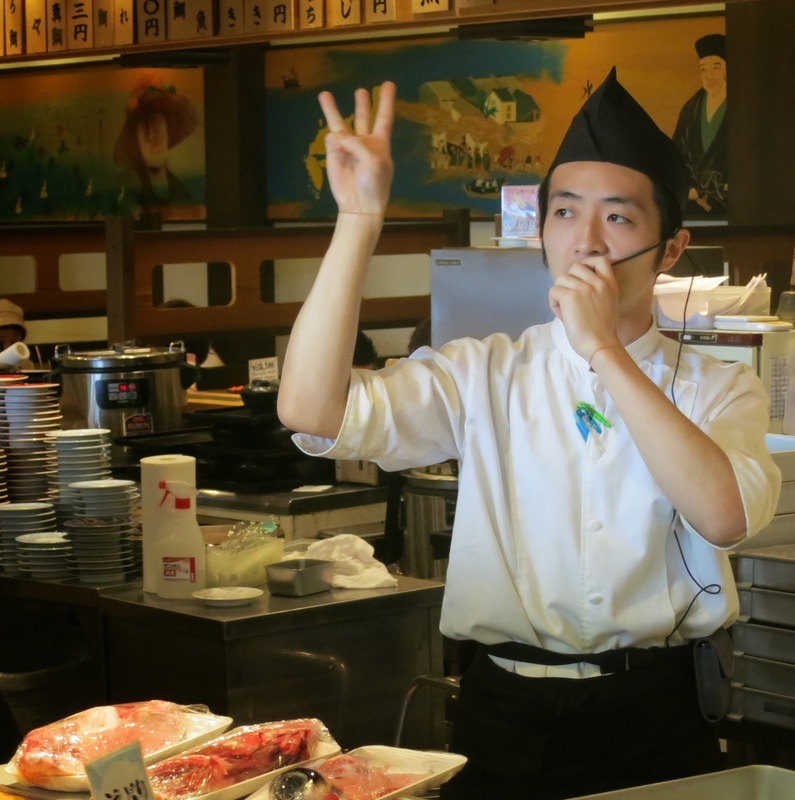 The cut pieces are passed to an assistant who quickly puts them in trays and wraps with cling film as the emcee gives a running commentary in Japanese and addresses the audience with an upraised arm. Members of the audience responding with counter-bids! When the audience responds with a chorus of Japanese words and similar upraised arms, I notice their pointed fingers and guess they are giving lower counter bids to the auctioneer’s offer price. As more fish parts are offered, the shouting gets louder as diners and members of the audience join in to call out bids. Carving a fish is certainly a fine art and I guess I can cope better with watching, probably because the process is bloodless. I learn that various parts of the tuna are sold separately because each part commands different prices – the most expensive being the fatter portions of the fish – like the Ootoro or belly meat. 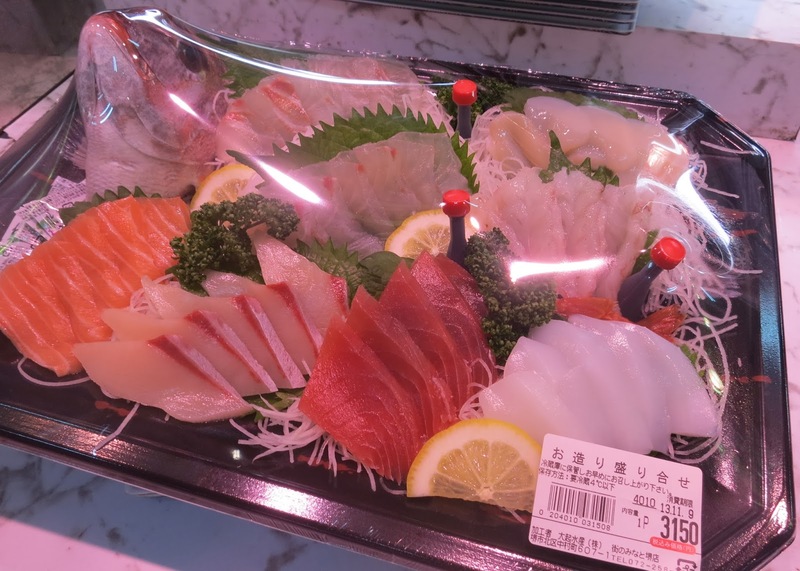 It is the norm for sashimi or raw fish connoisseurs to bid for the best deals and get their favourite parts of the fish for their own consumption or for re-sale in their restaurants. From the enthusiastic bidding for the fish parts, I can see that raw fish lovers know that the best parts of the fish tastes so good that they should never be cooked! As the bidding for freshly cut fish continues in the Daiki Suisan Kaiten Sushi restaurant, our group moves to the adjacent Daiki Suisan Fish Market for a tour of the wholesale outlet where shoppers can buy home fresh seafood or arrange for the restaurant to prepare and serve the seafood in a meal. 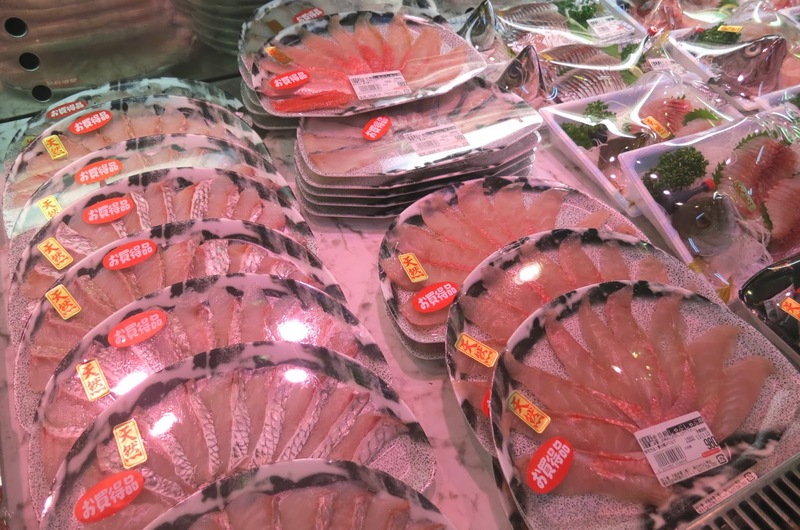 Established as a leading seafood wholesaler, Daiki Suisan has a distinct advantage as a retailer with their consistent supply of fresh products from around the country for their group of restaurants in the Kinki Region. Its past noon but the market still has a throng of shoppers browsing around in the various sections to buy fresh fish, shell-fish, prawns and snow crabs, pre-cooked seafood as well as packed cooked meals. 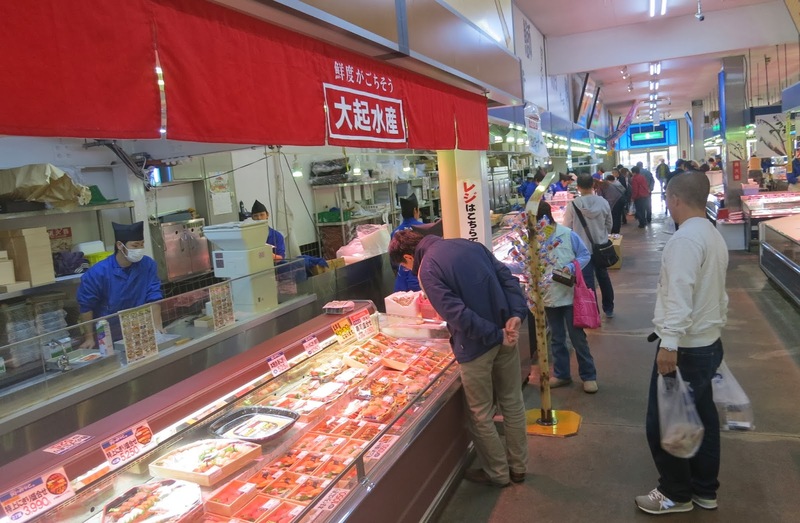 As I walk around the market to look at the interesting range of seafood, I’m also stealing looks at the shoppers and thinking about the traditional Japanese diet that promotes longer life spans. The Japanese has the longest life expectancy in the world, averaging 78 years for men and 85 for women, and many Japanese look remarkably young for their age. As I watch one of their staff slicing raw fish before arranging them in a pretty fan on a plate, I’m convinced that I should adopt the Japanese eating habit because raw fish retains more nutrients and slows down the aging process! Take your pick of fresh cuts of sashimi! Besides obtaining fresh produce from the sea, I learnt that Daiki Suisan also cultivates tuna to meet the demand for quality seafood. 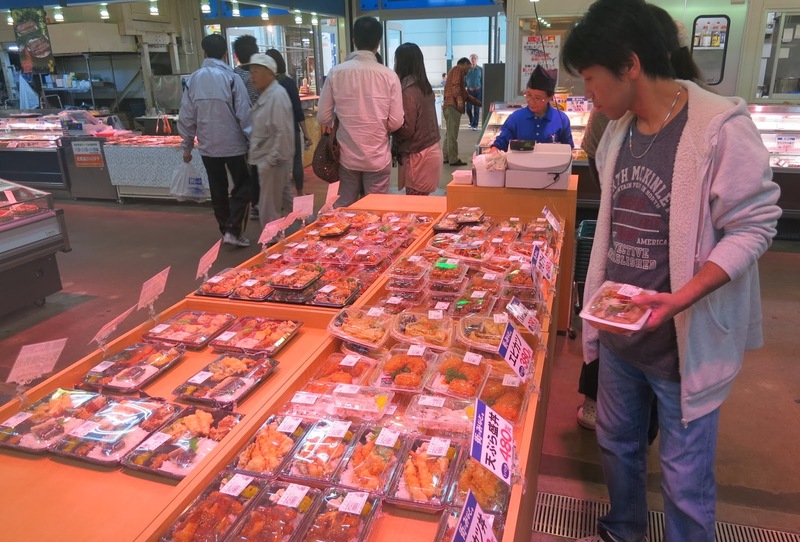 Looking at all this food in the market is making me hungry and I’m overjoyed when the tour ended with an invitation to dine in the adjacent Daiki Suisan restaurant. As the first course of appetizers is served, we exchange a polite, “Itadakimasu” the Japanese wish equivalent to Bon Appetite among our group members before tucking into our delightful lunch made with the freshest seafood. Sashimi can't get any fresher than platters like these from the fish market! as he painted the street with a broomstick! When artist Alvin Tan, a San Francisco-based Malaysian artist was travelling on public transport in Asia recently, he observed that there was virtually no human contact among fellow commuters. As the advancement and convenience of technology is being used to save lives, he was troubled that it is also isolating people who are too preoccupied with their devices that they are losing touch with each other. This observation was like a “culture shock” to him and became the inspiration for him to express the irony of people who are being connected by electronic devices but yet are getting more disconnected with the people around them. Tan, a 1976 graduate of the Kuala Lumpur College of Arts, went to further his art education with the Accademia di Belle Arte Roma in Rome. 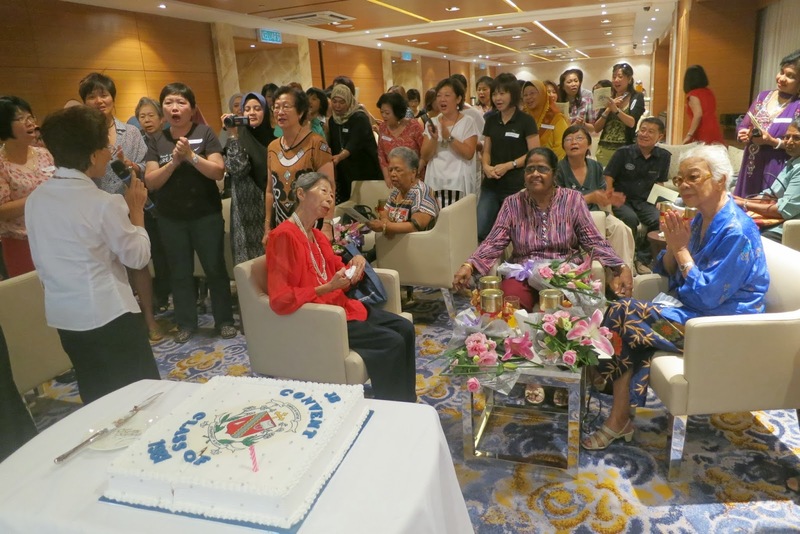 His exposure to the art world abroad and its potential in Malaysia encouraged him to relocate his entire family from Alor Setar to live in Johor Baru in 1982. As his parents and siblings settled down here, Tan used to commute to work in Singapore with the Nanyang Academy of Fine Arts where he lectured in Western Art History and the Aesthetics of Art and Psychology of Art until 1989 when he continued his education with the California College of the Arts, Oakland in USA. Since 1978, Tan has participated in art exhibitions held in Portugal, Italy, Singapore and the USA where he presented solo, partner and group exhibits. He was among the pioneers of the Singapore Artists Village who joined founder, Tang Da Wu, in the art colony in the late 1980s to exchange ideas and encourage artists in new experiences and experiments. While he continued his art studies with the Academy of Art University in San Francisco between 1991 and 1993, this prolific artist presented a number of solo exhibitions in San Francisco and Singapore, and in 1995 he was commissioned to create a wall mural in the Parrot Paradise of the Jurong Bird Park. Last December Tan, a Peranakan of Teochew origin, who works and lives in the San Francisco Bay Area with his wife and family, was visiting Johor Baru and seeking a contemporary art space in the city to make an impact with his art. 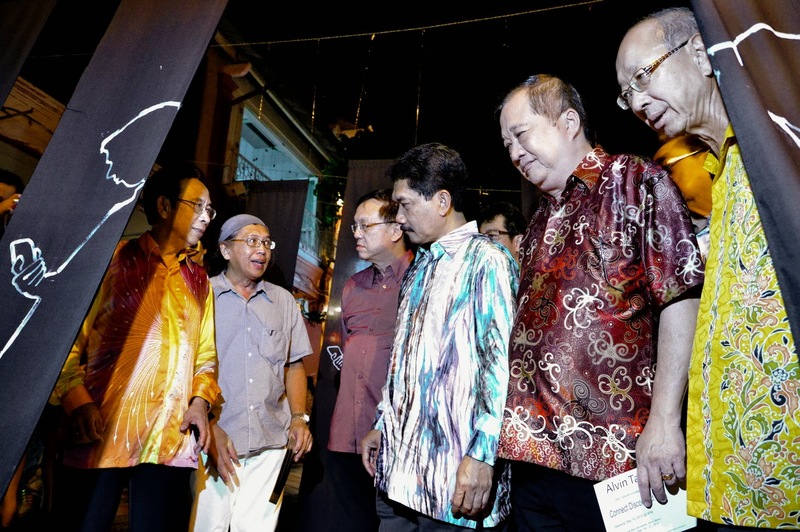 As he explored the heart of the city and discovered the charm of Tan Hiok Nee Heritage Walk, he concluded that Johor Baru is more than ready to experience art in the city. He was delighted to receive the green-light from the Tan Hiok Nee Heritage Walk Committee and went about getting the materials and sponsorship to create his site-specific art installation that he aptly entitled, Connect Disconnect. His artwork that was first put up on Dec 14, attracted so much attention that he was encouraged to present it again on Dec 21. This installation comprised 120 pieces of 7-ft long buntings that were suspended along a 15-meter length of the Tan Hiok Nee Heritage Walk that was painted in Tan’s distinctive style. 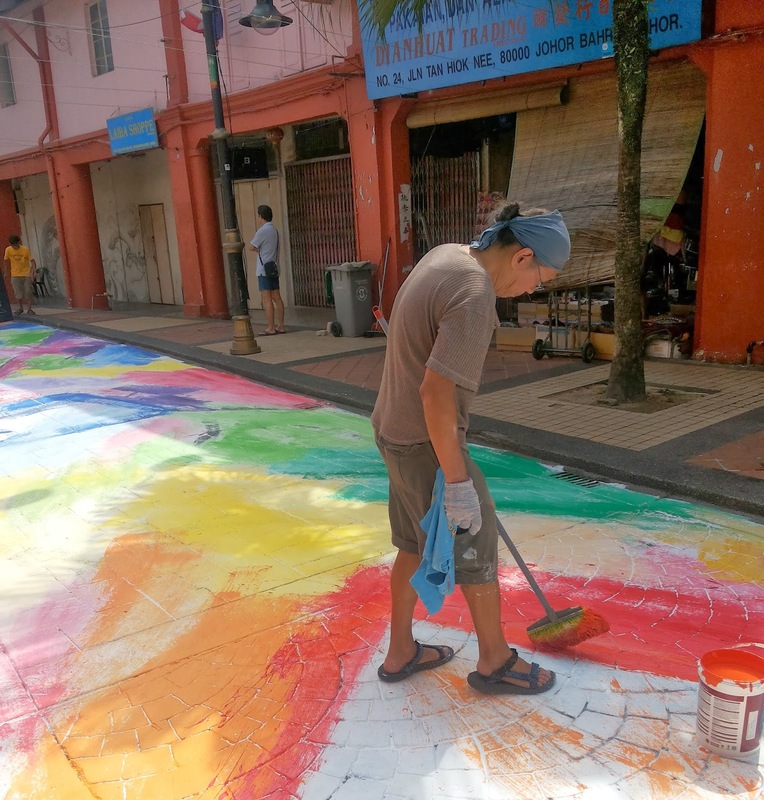 This length of the street, painted in a range of colourful paints sponsored by Colourland Paints, inevitably attracted a great deal of attention particularly when Tan was painting the street with a broomstick! He explained that the street, painted in bright colours, represented the world at our feet. He believed that everyone should be able to relate to colours and chose to use colour in various shades and intensities as a language to communicate our moods. He hoped that the attractive colours would encourage people to look at the beauty that surrounds us and literally, “stop and smell the roses” rather than be preoccupied with their electronic devices. Just as I said in, Once again, our school year is upon us (NST Dec 31, 2013) the roads outside the schools in Johor were lined with cars throughout the day on 31 Dec when parents went in for student registrations. At mid-week on Jan 1, the usual chaos reigned for parents and students, teachers and administration staff as well as school bus drivers on the first day back at school. Just two days into the new school term, they had a welcome breather when the first new weekend arrived on Friday and Saturday. Like most people in Johor, I’m waiting and watching and trying to get into the groove of the new weekend. While there is a lot going on about adopting new routines and adapting to the changes, I’m ready to adjust and enjoy whatever is possible while life goes on around us. Because Friday is maintained as a holy day, I’m mindful that a great deal of activities is now cramped into Saturday, particularly on Saturday nights, and wonder if I can cope with attending all of them. In a shopping mall last Friday, my friend and I were considering the dining options for lunch and we were obviously drawn to the colourful buntings that advertised their set lunch promotions. Some of the dining deals looked very attractive and we checked out several options before deciding on the restaurant that we both agreed on. The helpful waitress was ready to seat us when I casually asked about their lunch promo and she told us that it does not apply on Friday because the promo is for weekdays only! Miffed by this disappointment, we went around the mall doing a quick survey of some of the food outlets with weekday or weekend promos and came to the interesting conclusion that their staff are not quite informed about the current deals. That’s probably because their employers or franchise owners with Federal headquarters are also ill prepared for the weekend change and its implications to such promos. If you are a fan of McDonald’s breakfasts, just be aware that their weekday breakfast sets are no longer available in Johor on Fridays but fans of Sushi King will be delighted that their weekday promotions still apply from Mondays to Fridays. There will also be countless hiccups and much confusion among the general public who have dealings with Government departments and it will take some time before things settle down into an acceptable norm. Staff in Government offices, particularly in hospitals and clinics, must pay closer attention to the calendar when they fix the date for the next doctor’s appointments for patients. If the medical staff inadvertently wrote an appointment date that falls on a Friday, the poor patients may obediently return for their appointment, only to be disappointed to find the clinic closed on Fridays! Check that your car park coupons are still valid! One of the questions I was asked last Friday is if Friday was a free parking day and my quick reply is, “No!” because Sundays will remain the free parking day in Johor Baru. This raised the question of who will be checking the parking coupons if it was a weekend in Johor but I learnt that the parking coupon checkers are contract staff who will remain in operation on Fridays. So don’t forget to display your parking coupons on Fridays and Saturdays to avoid unnecessary fines and please check if your coupons are valid for 2014! For pensioners like my parents, the new year probably means putting up a new calendar and in our house, they must have the traditional kuda calendar where dates are indicated in a monthly grid. One glance at the illustrations in the boxes will show us a great deal of info including the public holidays and the Saturday and Sunday horse race days that earned this calendar its name. While it may seem that the new weekend may not affect pensioners, I know it’s going to take a bit of time for us to adjust to the new weekend activities like a change in the day we go to church. 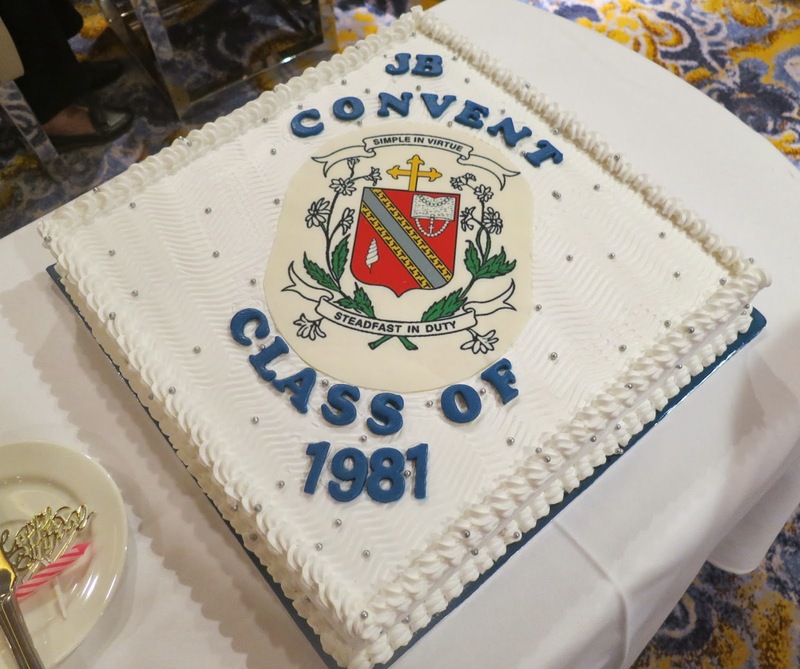 It looked like the first new weekend of the year was working itself out nicely as I enjoyed a leisurely buffet lunch with the family and had a restful afternoon before going to evening service on Saturday. As I turned the covers on my bed to settle in for the night, I felt as though it was a Sunday night because it will be a school and work day tomorrow. The next morning, I got up automatically thinking I should be heading to church after breakfast but stopped when I suddenly realised that there’s no morning service and I had the whole day ahead to rest and relax.